Well this is more of an overview and what I learned than a straight-up review, but that's my version of a book review. I would highly recommend this book to anyone struggling with kids, or their own behavior with kids. I began reading this book out of desperation: desperate fear that I'd become all my parents' unadmirableness. We all have those fears, right? Anyway, I'd decided I didn't have any business having kids until I feel a bit more stable with my reactions towards them when they are angry/uncooperative/mean. I'm fine all the rest of the time. In fact, I love kids! I love playing dress-ups and barbies and cars and building things and exploring things with them... But I really struggle with the stormy side of kids. I either ignore the issue, freeze up and watch helplessly, or explode. There has got to be better way, right? Here are some tips from "Kids Are Worth It." Brickwall is the classic controlling parent: you do what I say when I say it or else. Jellyfish parents let anything slide and do the apologizing for the child--fix all their problems. Backbone parents are the ideal. When there is a problem, brickwall parents force and control, whether it be physical force or emotional manipulation. Jellyfish 1 parents come from a brickwall background and have vowed to never control, so they do the opposite. But when a crisis comes up and they must do something, the only 'tools' they know to use are force and controlling. They are unpredictable. I believe I fall somewhat into the Jellyfish category. I tend to let things go- I thought I was picking my battles-- but then there is always some point where it gets to be too much (the kid doesn't know where that point is for me though) and something must be done. Discipline should be Reasonable, Simple, Valuable and Practical. Example: Mom's been decorating a cake for grandma's b-day party. Daughter wants to show her friend and in the process dumps the cake on the floor. Mom takes a deep breath, maybe leaves the room for a moment, then says "you have a problem. I know you can handle this." Helps daughter pick up the cake and leaves while daughter re-frosts the cake. Tip: Discipline doesn't have to be painful. Example: haircuts. Some people may think a mohawk is morally-threatening, but for the rest of us, let the child decide what they want. Give them the signal that they can be themselves and be accepted by you. If you do it, the kids will too. This has been incredibly difficult for me in my life. Perhaps 1. because I rarely if never saw adults do it and 2. when I did admit my mistakes as a kid it was never a productive thing. Always painful and usually got punished. It has been SO hard/embarrassing beyond livability/simply impossible for me to admit mistakes, out loud. But I'm getting better. And the more I do it the more I realize it really isn't that bad, and it's always better afterwards. Ignoring problems is not the way to go. I have a great example in my in-laws and especially my husband. This world where people admit their mistakes, solve the problem and then move on is a foreign one to me, but I'm loving living in it. "Those of us who grew up with destructive tools may never be able to rid ourselves totally of them, but we can make sure we don't use them on our kids. Reward: our kids will probably not find those tools in their own toolboxes. I don't believe it is an issue of genetics, but one of learning." I would consider my parenting career a HUGE success if my children come out of it without a temper-reflex. 3. State your belief. (I believe we should each pick up our OWN clothes). 4. State what they have done, but avoid derogatory/accusatory phrases. (this past week you have left your clothes on the floor in the bathroom every day, NOT 'you always leave your clothes on the floor'. Avoid ALWAYS at all costs. Never say never turns into never say always. 5. State what you want from them. 6. Be open to their perspective. Don't ask bad questions, instead, replace them with a statement. 6. Be careful! (this makes them not tell you when something went wrong, because they think you'll blame them for not being careful, when really, accidents are not usually a case of being not careful. [Except in my case as an extremely talented clutz, I really can prevent lots of problems just by slowing down and being more careful). Accept realities and solve Problems. I believe we too often dwell on unproductive things: the fact that there is a problem /wishing it hadn't happened/who's at fault. None of those things will fix the problem. And once there is a problem, there's no going back, only forward. Quit plaguing yourself worrying about blame and move forward to solve the problem. Accept realities and Solve the Problem. Rub their back, stroke their hair. Talk calmly and label their feelings: "you're angry. I understand you're angry because you want so-and-so..."
There is HUGE power in this concept. People very often just want their feelings acknowledged, and that helps them move on. Teach the difference between tattling and telling. Tattling gets them in trouble. Telling gets them out of trouble. They weren't supposed to climb the tree. Telling is when they are falling out and screaming for help- you tell to help get them OUT of trouble, not to get them punished. There is also great power in this once they become teenagers. Encouragement and Praise are different. Praise is manipulative. Constructive criticism or praise focuses on the deed, not the child. When a child comes home with something good or bad (think report card), don't get all excited or disappointed, ASK them to tell you about it. Then confirm their feelings or encourage. Don't read a mark of character into a deed well done or poorly done. There is no 'good or bad boy'. The good or bad is the deed. Separate them. I believe people are innately good. In Primary I work with a couple of kids. One in particular can't sit still, a problem in Singing-time. They lie on the chairs, on my lap, sit on their feet on the chairs, play with my hair, try to start a tickle fight, share stories rather than sing or listen... And we sit in the very front row. Lately I've taken to removing myself and the child from the situation. Sometimes I try to sit them up (physically position them. but that becomes a game they always win). One time I took the child out for an extensive period, but then the rest of my class was left to be crazy with no teacher. Last time I took the child and sat in the back. Eventually the rest of my class joined me (why were they wandering around? But once they came to the back they wanted to stay there with me.) But they weren't any better in the back of the room, I just felt better because now weren't distracting everyone. A parent came in for their child's scripture reading and sat in the back with us. She is a special-needs mother and teacher. She acted a bit disgusted by my class' behavior. Some tips would have been much more welcome than the disgust. One week I talked to them about respect. I don't want them playing with my hair in singing time because it makes me look silly in front of everyone. I don't want them standing up in singingtime because then others can't see. I don't want them lying on the chairs in singing time because this isn't sleep time. Here\s the catch though, sometimes I let them lay on my lap because then they hold still for an extended period of time, and stay calm. Sometimes I braid their hair while they are lying on my lap to keep them still for longer. That backfired. "I don't want braids in my hair today, but I can braid yours for you!" Anyone have some insight for me? Ideas? My spouse and I were asked to join a small choir singing a French Christmas carol, and it was fun to spend the hours practicing together as a couple and with the choir. We performed at a Stake Christmas Concert, and we all wore red scarves to make it a bit more 'frenchy'. :) I also sang in a double quartet, which was a pleasure. All of the memebers were excellent musicians, which made it so much fun. I love feeling like a bit of a band-nerd again and 'getting' the corny music jokes and lingo. One evening my honey came home from work and said he had a surprise for me, fishing something out of his pocket. Tickets... I looked closer... SYMPHONY tickets! He was going to take me to the Symphony! Ohh I was so excited about that! (That seemed like something only rich people do). (Maybe it is, we got them for free). It wasn't until a few days later that he told me the tickets were for Handel's Messiah. Oh man it just kept getting better! Handel's Messiah at the Symphony. I was in heaven. It took a little while to really get into the music for me, but by intermission I was floating on clouds- my soul singing along with them. It was beautiful. I missed there being a brass section, though, as it was only a wind-orchestra (plus one trumpet for the trumpet piece). When the trumpet began playing, I knew what had been missing for me during that first half. No brass! I guess I really am a brass-instrument kind of girl. I love the feeling of brass music. Thanks honey for taking me to the Symphony! Our first work-Christmas-party together was quite the do. It was a formal; cocktails and dancing. I went formal-dress hunting a few weeks earlier, and was able to score a beautiful red-sparkly mermaid style dress, with a white and gold-trimmed bolero to go with. Guess where I found this amazing outfit?? The local thrift store. I love finding amazing things like that at thrift stores. The work party was a lot of fun. I had already met a few of my spouse's co-workers at the summer BBQ, so it was fun to catch up and get to know them better. The dinner was wonderful, and the dessert table exciting (They had a Bouche-de-Noel!). We chatted with those at our table and then there was dancing!! We rocked the floor with some crazy cha-cha and lots of swing. It is so fun that both of us enjoy dancing. We had friends over for fondue one evening, and we went all out on this dinner party. Bubbly 'champagne' in the Christmas goblets we've been using all month, shrimp and cocktail sauce, and lots of delicious veggies and meat for the fondue, which lasted about 2 hours. We played board games and generally enjoyed the evening. One of my love's friends has an Eggnog Party every year at Christmas time, and we were in town to go this year. This was my first occasion trying homemade eggnog. Not bad, though I can't say it is my favorite beverage. It's a fun tradition anyhow! We also went to another friend's Christmas party that was a big get together of soup, snacks, family, and my honey's old friends. I met some neat people with some really amazing stories (Escaping a massacred African village with 5 village children, the only survivors; meeting their love online and moving to New Zealand...). And the lovely hostess took our picture before we headed to the work Christmas party. Thanks! The tutoring company I work for had a Christmas dinner too. The man running the company is Korean, and basically all the students are Korean, and basically all the tutors are...something else. We ate at a Chinese restaurant, which was delicious of course! Lets see if I can remember the ethnicities of the other tutors who attended: Guyanan, Philippino , White, White, Chinese, Franco-Albertan. It was an interesting group, most of us had traveled to various parts of the world and were sub-experts on various subjects such as subways in Asian countries, North Korea, Japan's non-immigration policies and honesty culture, Europe vs Asia, and getting ripped off in a foreign country (especially if you look like a native). It was a really enjoyable dinner conversation! Sometimes I have a hard time connecting to people, but this was a breeze. It helped to remind me that there isn't something wrong with me (I've been struggling to find/make friends, lol), I just need to find people with similar interests. I hope everyone enjoys their own versions of December Delights, and feel the joy of the season in spite of the business. Merry Christmas! She opened the door of our bedroom and stood in the doorway...It was a Saturday night and we were in our bunkbeds, getting ready for bed, talking. She was angry, but blown out. She was agitated, but not at us. "This isn't the best time to do this, but it's better than not," she said, still with agitation in her voice. "I'm sorry. Ok?!" "Ok," we replied. She paused for a moment, then left. I've often pondered those words "this isn't the best time." I've decided any time is a good time to say sorry and be forgiven. As my spirit lingered in that memory and I heard the words of this song all around me, a delightful presence of peace distilled upon my heart, in my soul. She was trying. Thinking back now it is strange to me that the "I'm sorry" had no hugs or calmness to go with it; rather it was abrubt and almost chaff. But she was trying. And, I think, succeeding. And we forgave her. This was a beautiful and meaningful memory for me, coupled by the peaceful feeling of forgiveness and quiet encouragement concerning her. "Don't give up," was whispered to my soul. "Don't rewrite your memory with only the problems being the actors." And though it didn't concern this memory, I realized that our forgiveness of others is sometimes a gift granted by Heavenly Father. Some things we just can't move beyond on our own. Tears streamed down my cheeks as my gratitude to God was sent to heaven on the melody of the hymn. The last few months have been a very real inner search for me, as I have tried to define my purpose, my mission in my new life. Always before I had a goal, a game plan, a course to follow, something to work towards the completion of. Now schooling and internships are over and my search has been for something new to replace that. But it is pretty hard to define your purpose/mission for the next 50 years-- life is always changing! I eventually came to the realization that I was looking too far, totally missing my mark. The big things I have always dreamed of having, I now have! Right in front of me everyday! The most important part of which is my dear husband. He is my dream come true. Living with, being married to, taking care of and loving this man is a dream come true. I guess I needed to realize that life doesn't always have to be a chase, sometimes it is best spent enjoying and bettering what you already have. 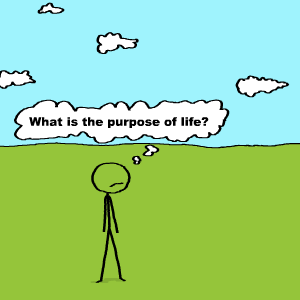 I read a book yesterday titled "Man's Search for Meaning," by Viktor E. Frankl, a German doctor who lived through the concentration camps of WWII. Some of his philosophies reinforced my conclusion, and helped me gain a more insightful outlook on my purpose in this life. 1. Having goals and striving to achieve them give life purpose. "The true meaning of life is discovered in the world, rather than within man, as though it were a closed system. ...by giving himself to a cause to serve or another person to love... that love is the ultimate and the highest goal to which man can aspire... The salvation of man is through love and in love." p37. I love that he came to this conclusion, because it is the same conclusion I have come to on my own. 2. Having a beloved, and actively loving that person, gives a life ultimate purpose and meaning. This last principle is an important one to me, it helped me gain a much clearer perspective on the goals and missions we strive to accomplish in life, and that there is not one overarching goal I need to know RIGHT NOW for the rest of my life (other than loving my beloved).